To complete the season in the Four Oaks and District League the Brian Goodman and Ken Rust cup finals were played off. The Brian Goodman final turned out to be a consolation prize for the first division runner up, The Boat as they proved too strong for Golden Hind as they raced into a 5-0 lead before Golden Hind could get on the score sheet. M.Tedstone took the sixth game for Golden Hind and W.Naylor the seventh to make the end result a more respectable 7-2. Boldmere Tap led 4-1 in the Ken Rust Cup before Plough and Arrows fought back winning the next two games. Any hope of a victory was denied for Plough and Arrows when Boldmere Tap, the third division winners took the eighth game and the match 5-4. The Annual General Meeting for the league for the 2018 – 2019 season will be held at the Red Lion, Station Road, Erdington, B23 6UG on Sunday 29th July 2018 at 10.30am prompt. Pubs and Clubs both old and new interested in entering a team for the forthcoming season should contact the league secretary M.Gaughan, 629 College Road, Kingstanding, Birmingham, B44 0AT, telephone number 0121-244-9607 or mobile 07830-346715. The Forest of Arden Winter League have introduced a new knockout into their itinerary the Dave Duncan 3-A-Side Cup in memory of the late Dave Duncan. In the semi-finals Derek’s Team beat Dunky’s Girls 2-1and Dunky’s Boys won 3-0 against Steve’s Team. The final was another straight 3-0 win for Dunky’s Boys team consisting of Bob Nixon, John Sidwell and Pete Yardley with runners up Derek’s Team comprising Derek Duggan, Keith Duggan and Dan Ryecroft. Runners Up Keith Duggan, Dan Ryecroft, Sue Kingdon (Organiser) and Derek Duggan. Week 23 in the Erdington Red Lion Double Top League was a good week for leader Will Naylor as he added a further four wins to his tally winning 3-0 against Clive Austin, Alex Downes and Richard O’Grady plus a 2-1 result over Lee Austin to put him on 111 points giving him a 13 points lead over second in the table Dean Bayliss who after winning 3-0 against Lee Austin had a vital 2-1 win over third in the table John Frost to open up a gap of eight points between the two players. Journeys End Lions rounded off their season in the Camp Hill League with a 5-2 win over White Swan Nomads who dropped two places to fifth while Journeys finished as champions on 30 points with Holy Souls confirmed as runners up on 26 points after their final 5-2 win at Devil’s Club. 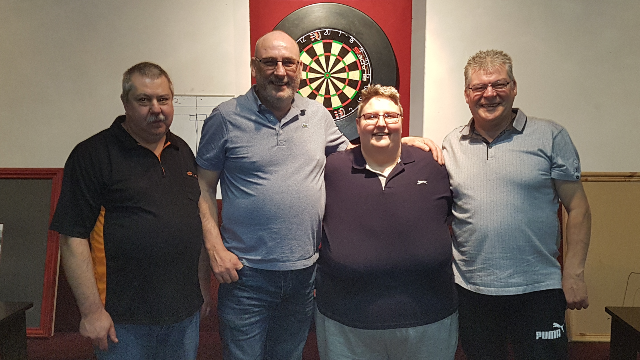 Three teams ended the campaign on 20 points with Tyseley WMC having the superior average over both Cotterills Lane Club and White Swan Nomads to take third place. Rubery RBL held on to their two points lead plus a game in hand at the top of the Kings Norton League when they won their home tie with Thurlestone 5-2. Second placed Avenue Social did their average no harm at all as they handed out a 7-0 whitewash to their visitors next to bottom of the table Man on the Moon. There was a rare win for Weoley Hill as they made it four wins from sixteen games when they defeated Grant Arms 6-1, Grant are two places and six points to the good on their victors. Some good individual performances in the week as V.Gould (Avenue Social) broke with 160, N.Harris (Man on the Moon) hit a 180 and O.Draper (Weoley Hill) recorded a 158 game shot. 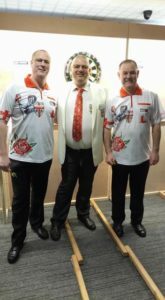 The best game of the week went to Rubery RBL player S.Hodges who checked out in just 8 darts. With sixteen fixtures completed East Birmingham Allotment Holders Association increased their lead at the top of the Small Heath League to six points when they beat second in the table Heartlands Club 6-3. Despite a similar 6-3 win for third placed Sheldon Marlborough Flights against Wagon and Horses they remain eight points short of Heartlands. Warwickshire County players Nigel Heydon and Kevin Dowling with County Chairman and England Selector Neil Pritchard lining up before their England debuts in the BDO British Internationals game at Penydarren Social Club, Merthyr Tydfil, Wales. Nigel Heydon, Neil Pritchard and Kevin Dowling. The Brierley Hill Friday Night League staged the final of their League Cup and taking the honours with a 4-1 win over league runners up Netherton Cricket Club ‘A’ were league champions Brickmakers Arms ‘A’. The league will be holding their AGM to form the 2018-2019 season on Sunday 20th May at Dudley Sports beginning at 11.00am, all teams both old and new are cordially invited to attend. The Sheldon and District Winter League played their Doubles Knockout down to the last sixteen pairs at two venues Meadway Sports and Social and the Crown at Olton. Results are not in from the Crown but winning through from Meadway were Matt Stait & Sean Lysaght (Fox and Goose), Bob Nixon & John Sidwell, Jason Jennings & Simon Edwards (Dunky’s Boys), Roy Parry & Jim Green, Robbie Earl & Jason Evans (Iron Horse), Brad Evans & Mathew Morgan (Pavillions), Chris Millward snr & Dave Humphries, Mark Birch & Ben Liggins (Sheldon Marlborough). On Friday 4th May the Harborne League will be taking on the Kings Norton League in a charity match with all proceeds going to Air Ambulance. The charity night will be hosted by the Avenue Social Club, Weoley Avenue, Birmingham, B29 6PS with proceedings getting underway at 8.00pm. Why not drop in and support a very worthy cause and also see some entertaining games of darts. The top two teams in the Cradley Tuesday Night League had carbon copy games in week seven as leaders Brickmakers Arms won 9-0 against White Horse with S.Blewitt hitting a 180 and second placed Wheatsheaf, who are two points behind Brickmakers but from one game more, won 9-0 against Netherton Cricket Club ‘B’ with P.O’Brien hitting a 180. Wheatsheaf are leading both Netherton Cricket Club ‘A’ and Bulls Head on average as all three teams are on ten points, however both the Cricket Club and Bulls Head have a game in hand on Wheatsheaf. 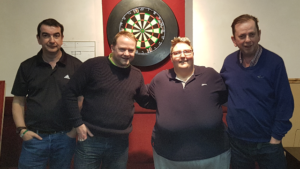 Dudley Ex Serviceman’s Club have opened up a three points lead at the top of the Netherton Thursday Night League after beating their nearest rivals second placed Bulls Head 5-4. Riddins Tavern and Townsend Club have now joined Bulls Head on 12 points after Riddings beat White Horse 5-4 and Townsend won 6-3 against The Crown who after six games are still without their first points of the season. Leaders of the Sedgley and Gornal Tuesday Night League Parkes Hall had a big win in week 22 when they won 6-3 against Ashwood who were third in the table and as a result of their defeat drop to fourth on 34 points six fewer than their victors. Former leaders and now second in the table Old Bulls Head also won 6-3 away to Hilly House, while taking over from Ashwood in third place is Gornal Labour Club their 7-2 home win over Pensnett Liberal Club giving them an average lead over Ashwood and Coseley Tavern, all three teams are on 34 points, Coseley winning 7-2 against Britannia. After losing 4-3 away to Wagon and Horses in their last league outing Tipton Sports have returned to winning ways in the Hilltop Friendly Tuesday Night League by beating fourth placed Dewdrop ‘A’ 4-3 to keep them two points ahead of the rest of the field. Island Inn just edge Wagon and Horses on average into second place after a 6-1 home win over Horseley Tavern while Wagon and Horses had a closer 4-3 verdict at Merry-Go-Round ‘A’, Island and Wagon are both on 18 points. There was a rare win for Merry-Go-Round ‘B’, their second in eleven games when they defeated Dewdrop ‘B’ 5-2 to lift them off the foot of the table to be replaced by their opponents, both teams have 4 points with only average separating them. Queens Head, leaders of the Main Division of the Pip Club League consolidated their position by handing out a 9-0 whitewash to their visiting team Wigginton Arms. Queens Head remain two points ahead of The Office who were also big winners as they chalked up an 8-1 win at Progressive Club and have played one game less the leaders. In the local derby between Dolphin Wanderers and Dolphin the 8-1 scoreline went to the Wanderers putting them fourth in the table on 26 points, four adrift of third placed Birchmoor Club but with two games in hand. Just two points separate the top three players in League One of the Yeltz Bar Tuesday Night Singles League, Duane Hart holds the number one spot, a 5-0 success against Phil Harrold putting him on 37 points just one more than second placed Matt Moore who beat Steve Carey 4-1 to keep him one point ahead of third in the table Simon Mountford after his 5-0 win against Mark Adams. In League Two Rob Smith has a four point’s buffer over his nearest rival Tommy Johnson, Smith’s latest victory being a close 3-2 over Johnson. Trevor Collier suffered his first defeat in eight games in League Three a crushing 5-0 to Richard Hill who has replaced him at the top of the table with 37 points, Collier dropping to fourth place on 32 but with a game in hand on Hill. Riley’s ‘C’ have taken over from Victoria at the top of the division one singles league in the Wolverhampton Tuesday Night League after beating Victoria 5-2, this being Victoria’s first defeat in the opening four games, Riley’s ‘C’ now being the only team in the division with a 100% win record. Wednesfield Legion hold that achievement in division two, their latest win being 6-1 away to the Royal, Albrighton. In division one of the doubles league its Victoria who lead the way with an unbeaten eight points, Wednesfield Conservative Club breathing down their neck on six points from their three games. Village Inn are top of the division two doubles league with an unbeaten eight points after a 2-1 success over Dog and Partridge ‘B’. After the first six games in the new season of the Tettenhall Wednesday Night League three teams are at the top of the table on ten points Whitmore Reans WMC, ECC ‘A’ and Hurst Hill. ECC ‘A’ lost pole position and drop to second on average after a somewhat surprising 4-3 home defeat by the Royal, Albrighton who are in a mid-table position. A 6-1 win at Pilot saw Whitmore replace ECC ‘A’ while a former table topper Hurst Hill drew level on ten points with the two teams above them with a 4-3 home win over Brewood British Legion.